From the school website...Lab School for Creative Learning " The Lab School for Creative Learning is an experiential, child centered school for children kindergarten through fifth grade. Here students are challenged to make the connections between the classroom and the outside world. Learning is hands-on, minds-on. The Lab School is a place where kids are encouraged to ask questions, think critically, and develop a love of learning. Located in the beautiful Fort Collins, Colorado, the Lab School for Creative Learning reflects the natural environment around it. This school intentionally is built around helping students discover themselves through experience and they take advantage of the close mountains by going on expeditionary learning trips once a quarter. The mission of the lab school is to empower individuals to build knowledge through identity, inquiry and interaction. Some unique qualities of the school include that students stay in a classroom with the same teacher for two years, allowing for a build up of trust with the student and teacher as well as giving them the ability to master skills and teach those skills to the younger group. Students practice many 21st century skills early on, such as collaborative work, technology literacy, critical thinking and reasoning, self direction and invention. District Goals Poudre School District has created a variety of goals and objectives to help shepherd the district in ensuring that the mission to Educate Every Child Every Day is being fulfilled. The Board of Education's District Ends Policy (DE 1.0) outlines the overarching goals for the district. The Superintendent is charged with implementing programs to fulfill these goals and objectives. DE 1.0 outlines PSD's five learning goals which seek to ensure that all students have a well-rounded education that prepares them to succeed in a changing world. DE 1.0 also outlines specific 21st Century Skills the board and district believe are necessary for students to succeed beyond high school either in a post-secondary institution or in the competitive workforce. Through the improvement process, PSD also creates a Unified Improvement Plan each year with outlines areas for improvement and strategies and means by which the district is working to increase student achievement. PSD Profile The Poudre School District is a high performing district in Northern Colorado. The district covers 1,856 square miles including Fort Collins, LaPorte, Timnath, Wellington, Red Feather, Livermore, Stove Prairie and parts of Windsor. PSD's school choice program allows families to select the school that best meets their child's educational needs. More than 70% of PSD families choose to send their children to their neighborhood school, the school localed in the attendance area in which they live. Space permitting, families may choose to send their child to a neighborhood or choice school located outside of their attendance area. PSD has 31 elementary schools, 10 middle schools, 7 high schools, 2 charter schools and 1 K-12 online school. Approximately 11,500 students are safely transported to and from school every day by the 129 PSD school buses. Transportation is offered to and from school for full-day Kindergarten as well as all neighborhood schools. Transportation is not offerred for school choice. The LAB school is home to some very creative and unique individuals. Walking into the school that was once Moore Elementary, visitors get to see right away the level of investment the students put in their school. Different projects are displayed on every surface of the walls, proclaiming different classrooms' individuality. 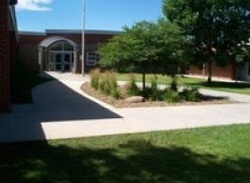 While the building is shared with Polaris, the expeditionary high school, one wing of the school holds the entire elementary division. At the very end of the hall sits a much quieter room. Tom's 4th and 5th grade class, closest to the playground, is a reserved, quiet classroom. Tom treats each student as an adult responsible for their own learning, and they have stepped up. They walk in quietly to the room, Tom greeting each one. They know what to do as they put their lunches away and their backpacks hung, then grab a chair and put it next to one of the tables they are choosing to sit at that day. The room is sparse, just a few tables, chairs stacked, a few computers in the back, and supplies organized neatly into boxes in the corner. Students begin to circle up around the Smartboard. Having both 4th and 5th graders creates a bit more diversity in experience. The demographics of the classroom reflects Fort Collins, with mostly white students, an African-American, two Hispanic decent students, and one Asian decent student. The classroom dynamic is very unique in how quiet and polite they are-- they are happy to politely work together. While they are engaged and excited about the project, they let their energy be put into what they are doing as opposed to expelling it in other ways. Each student provides insightful feedback about how projects are going, what they need to do, and reflecting on what other artists have done. 1. This male student enjoys working in a group with others. He loves Dr. Who and robotics. 2. This male student is somewhat quiet but enjoys working together with his friends. 3. This female student is always the first to raise her hand, proudly shows all her work to her teacher, and is happy to clean up after everyone. She struggles with working with others, but she is very vibrant. 4. This quiet female student is connected at the hip with another student. She doesn't speak up much in group discussion, but she will talk one on one. 5. This male student is quite a character. He loves video games, changes his name every other week, and is a leader in his small group. 6. This male student always wears a hat and is happy to share ideas. 8. This female student missed quite a few classes, but her friends have helped her catch up. She sometimes struggles with getting her voice heard in the group she is in. 9. This female student is a very happy person who enjoys art, but is somewhat lost in this project. She likes to help out the teacher, is relatively quiet, and enjoys hanging out with another quiet girl. 10. This female student may be the smallest in class, but that doesn't stop her from being very spunky! She is friends with the tallest girl in class, and seems to be the spokesperson at her table. She enjoys art and math. 11. This male student likes to wear his hat backwards, is into games, and loves to hang out with his friends. He rocked out the first project even though he missed one day. 12. This female student is the tallest in class but is very quiet. She smiles but is very reserved. She relies on her friend to speak for her for most things. 13. This male student is tall and lanky. He does not respond well to social cues and is on the autism scale. He does have some very interesting takes on what to do on his art projects. 14. This male student enjoys video games and Dr. Who. He does not talk much in discussions, but he gets very involved in his projects. 15. This male student is late quite often to class, but puts a lot of effort into his projects. He enjoys giant robots and one of his projects centered around the move Pacific Rim. 16. This female student has missed a few classes, but catches up with the help of (9). She does not like to ask questions to the teacher, but she puts in the effort and often has her friend ask questions for her. 17. This female student is very excited about the projects we do and is very exuberant in her explanations. She is very kinesthetic with her learning process. The Security Department promotes an inclusive and safe climate through proactive and innovative services, relationships, and communication. Campus Security Officers (CSO’s) and School Resource Officers (SRO’s) help keep students safe in Poudre School District. Security Systems The Security Department installs, repairs and supports all burglar alarms, access control, and digital video systems. If you have questions regarding security systems, please contact Norm Bastian (nbastian@psdschools.org) at 970-490-3523. Safe Environment Assessments The Security Department conducts Safe Environment Assessments on all schools annually. An integrated assessment team, comprised of district personnel and local law enforcement officers, visits school sites to work with site administrators to identify and find solutions for any school safety concerns. For more information about safe environment assessments, please contact Shawn Streeter (sstreete@psdschools.org) at 970-490-3279. For more information about training opportunities, please contact Shawn Streeter (sstreete@psdschools.org) at 970-490-3279. Response to Intervention (RtI) Response to Intervention is a framework that promotes a well-integrated system connecting general, compensatory, gifted, and special education in providing high quality, standards-based instruction and intervention that is matched to students' academic, social-emotional, and behavioral needs. The Colorado RtI Framework has evolved as we learn from implementation. There are no lines separating the tiers because we know that movement between tiers should be fluid; there are no "hoops" for children to jump through in order to receive more or less intensive interventions. The "flywheel" of the multi-tiered model is the Problem-Solving process. This process is how decisions are made regarding intensity and type of intervention students need. The RtI framework is surrounded by "Family and Community" to illustrate the understanding that the education of the child goes beyond the walls of our schools into the homes and communities of our students and to emphasize the importance of partnerships with family and community to support student success. English Language Acquisition (ELA) services help English Language Learners (ELLs) become proficient in everyday English, as well as classroom English, and to learn the necessary content to be successful in school and after graduation. All services include English language development and use of the Colorado English Language Proficiency Standards to differentiate for each student’s level of English language development. The strategies help each student reach English proficiency in listening, speaking, reading and writing. All gifted Poudre School District youth are identified by their strength areas and needs. PSD educational programming is designed and implemented to match their identified needs. Student progress and achievement is monitored through on-going dynamic assessment. Teachers of gifted students participate in professional development to increase knowledge, skills and understanding of gifted students and required instruction. Gifted children means those persons between the ages of five and twenty-one whose abilities, talents, and potential for accomplishment are so outstanding that they require special provisions to meet their educational needs. Gifted students include gifted students with disabilities (i.e. twice exceptional) and students with exceptional abilities or potential from all socio-economic and ethnic, cultural populations.